Are you going buggy for a salty snack? Why not try the other green meat? 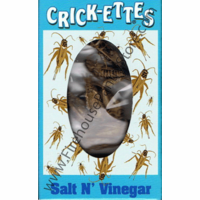 Crick-Ettes are real seasoned crickets that make a perfect bite-size treat! Makes a great stocking stuffer, Easter basket filler, or Halloween treat (or is it a trick?) I dare you! 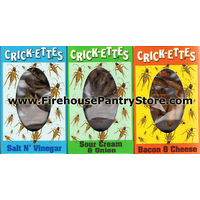 Three frightful flavors: Sour Cream & Onion, Salt & Vinegar, or Bacon & Cheese.